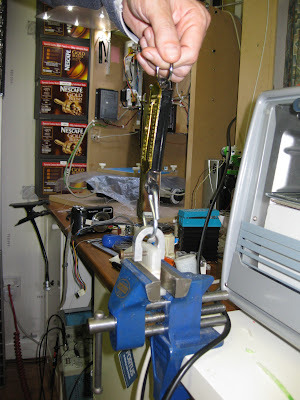 In the previous post, I described the rationale for adding a support material capability. It’s not needed for every object, but to have consistent results with tight tolerances, for many objects you cannot do without it. Also, by solving the support material challenge, we will also solve multi-material 3D printing, since both require multiple print head functionality. Last week I had the pleasure of directly working with Chris Palmer, a.k.a. “nophead”. His important findings have really made a difference to the results of many, and guided the RepRap towards better quality in terms of extruder design, countering warping, material capabilities, etc. Personally, seeing the results he achieved was a real motivation not to give up! Seeing solved the problem of oozing for PLA and ABS by reversing the stepper motor. The idea obviously wasn’t new, but the great result with this implementation was startling! This change is compatible with the Mendel design and any version two extruder from the RepRap project, as well as most custom built stepper based extruders. Besides solving oozing, a more important problem is solved, the material that oozes should have been part of the object. Especially with thin walled objects, it’s can make a section very weak. And since it’s the weakest link (or layer) that allows you to break a part, this has for me at least been a source of problems (weaker objects). When the thermoplastic has welded together properly, it should be very hard to break most parts. With weak sections it becomes a lot easier to break them. But back to our main topic: support material! Another thing that I was interested in seeing that I could dissolve PLA (polylactic acid), which is biodegradable, in caustic soda (lye, or NaOH). If you make an ABS object supported by PLA, the PLA should resist the ABS’ tendency to warp during the building of the object. Since PLA is harder than ABS, it provides a stiff support. This worked really well. We could, with varying temperatures get a from a very strong weld, to an (easy to remove) weak weld. This would allow us to break away bigger chunks of PLA for recycling and dissolve any remaining PLA in a lye or detergent solution. 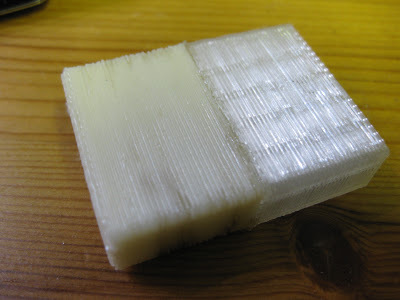 In our experiment, we printed a slab of PLA, with a block of ABS on top of it. On top of that was another layer of PLA. Above is the part made of ABS and PLA that we tore loose from the PLA base. The weld took several kilograms (or actually newtons) of force to tear them apart. I could break loose the PLA that was printed on top of the ABS, but only after fiddling with it a lot and finally putting some more force on it (we didn’t measure how much, though). make sure that it switches extruders in software. Make sure that the other stepper motor is driven (add hardware as well). I intend to share direction and enable pins between extruders. Also, it should offset all of the coordinates. I don’t want to do this in firmware, since I like to keep complexity at the side of the host (also more flexbily changed, no need for re-programming). Then again, it’s a matter of taste. I should level the heads, so that they are in exactly the same plane.